Our new 58 C builds on the success of the Gen I 58, but its pedigree also includes two generations of the 55 Convertible. 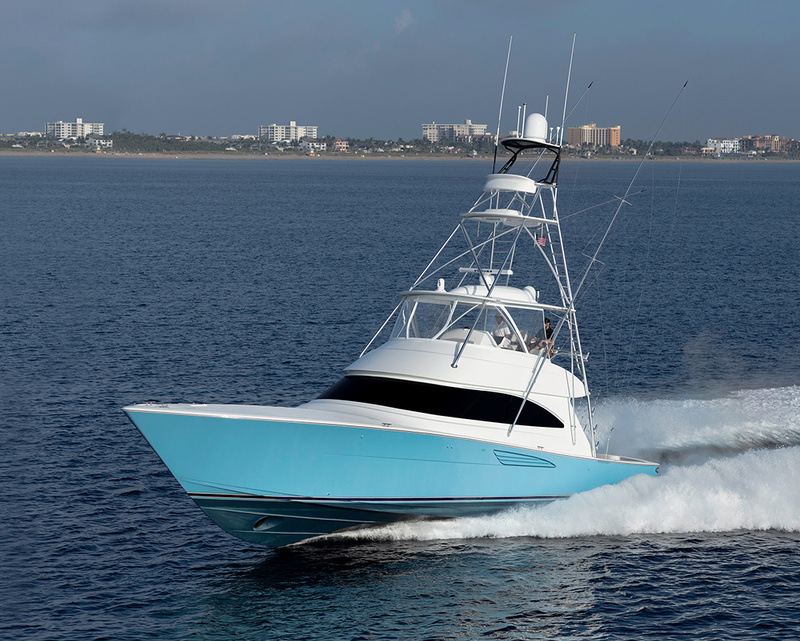 The latest 55 has dominated the mid-50-foot range since 2012, while the iconic first-generation of the 55 Convertible stands out as one the most important boats in Viking’s storied history. 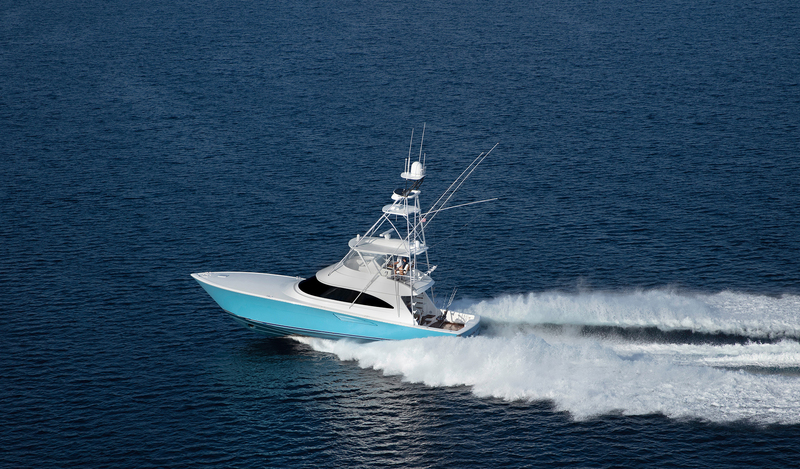 “Our design, engineering, boatbuilding and tournament experiences over the past 18 years evolved into the 58 that we have today,” says Pat. 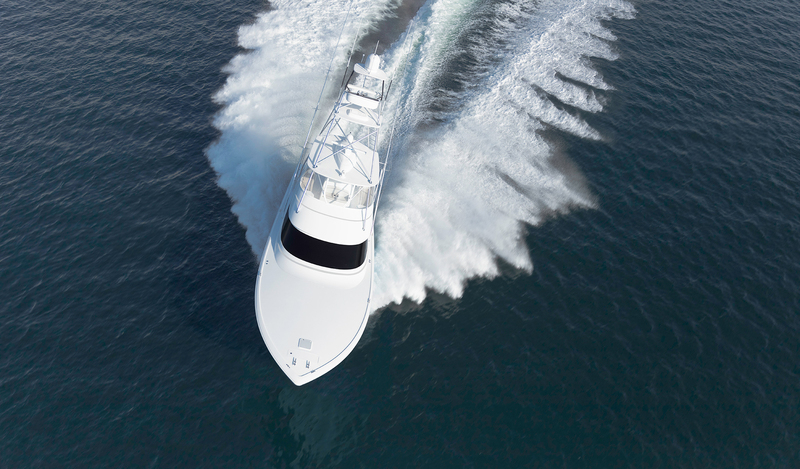 The underbody hull form allows the 58 C, despite its greater size, to achieve the same top speed as the 55 C, and with more efficient 10-cylinder engines. The performance of the new 58 C has been its most lauded attribute so far. 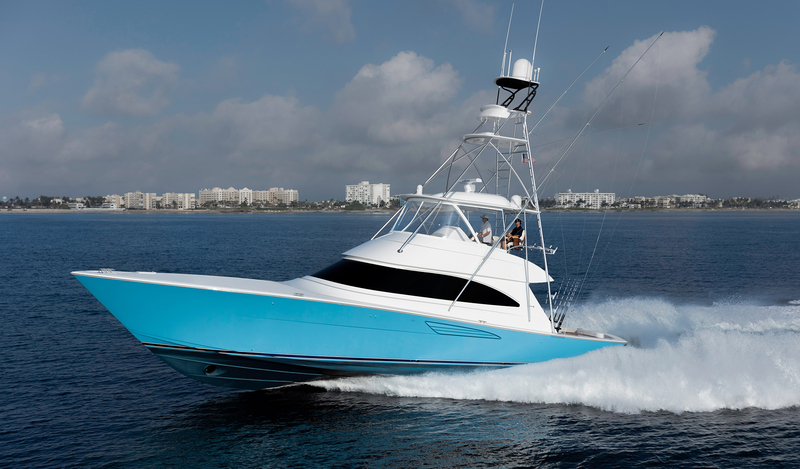 The boat has exhibited an incredible ability to keep spray down, running clean with its molded strakes guiding the water to break just aft of the house windshield. These performance attributes are due, in part, to the aggressive positioning of the strakes as well as their downturned angle and radiused shape. 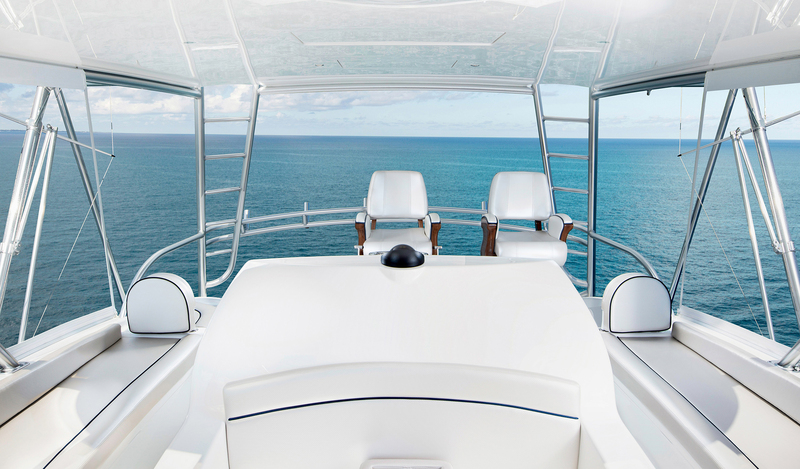 All areas benefit from the 58 C’s larger size, particularly the cockpit and the salon. 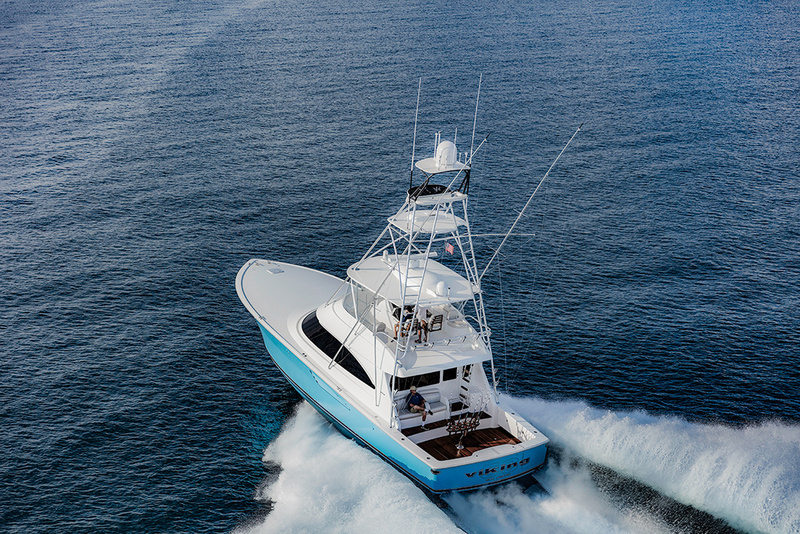 The 58 C’s cockpit is 14 square feet larger than the 55 C’s while still providing a full-featured mezzanine with a shaded seating area and beautifully upholstered cushions; freezer, cooler, bait and tackle storage; and engine access. 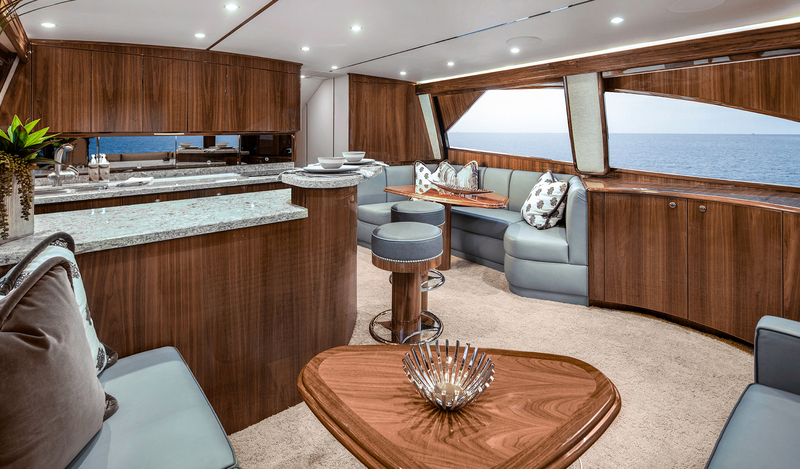 The main difference in the interior layout of these two boats is that the galley-and-dinette arrangement has been reversed. 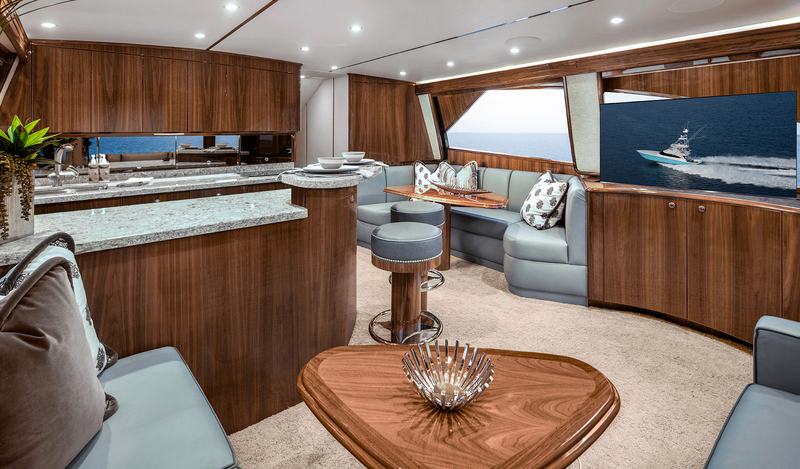 The 58’s galley is on the port side, while the dinette takes the starboard position. 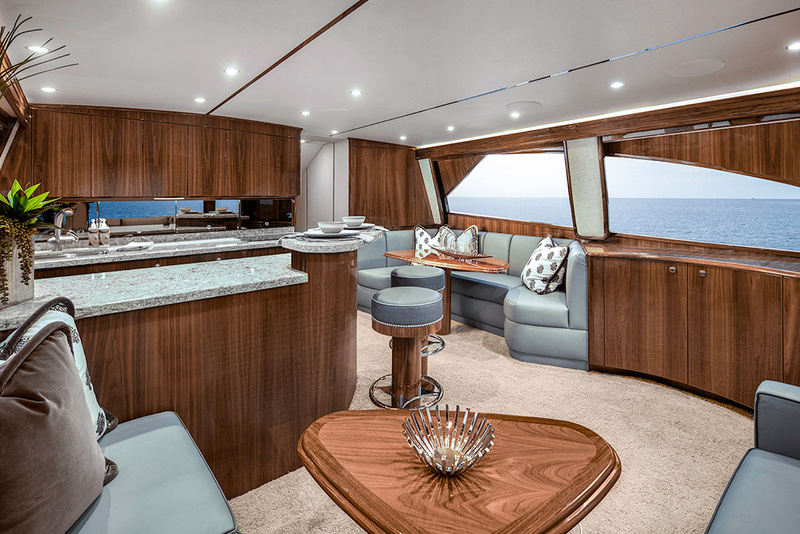 The result: a more streamlined layout with a convenient companionway that extends in a straight line from the starboard-side salon door all the way to the forepeak. 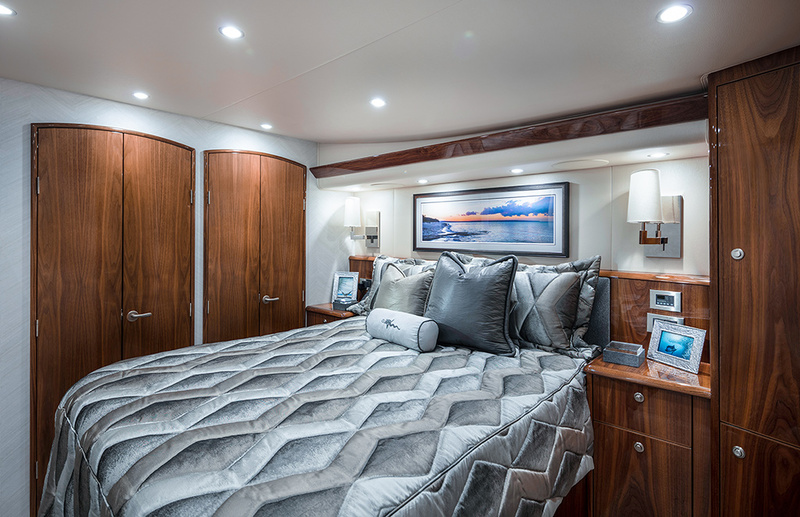 Below, the master stateroom is now on the port side with an athwartships bed that allows for increased walkaround and hanging locker space. 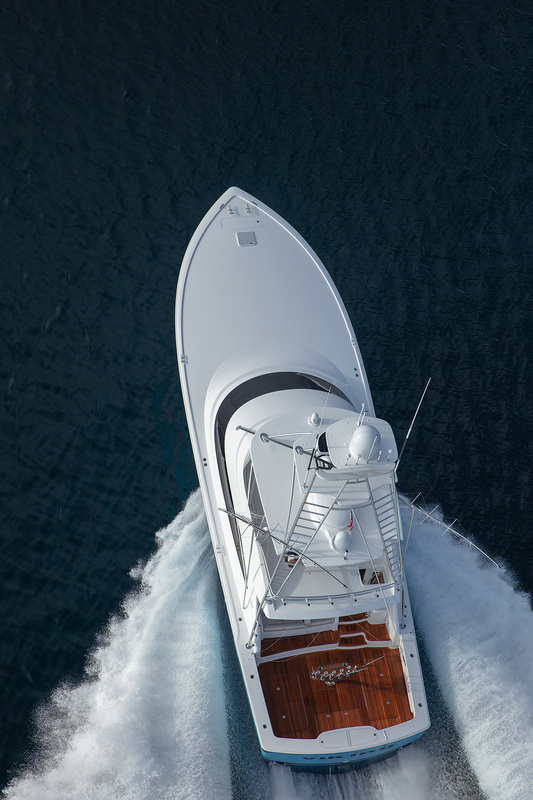 Efficiency can be seen in every area throughout the boat, including the mechanical systems in the engineroom and lazarette. While two generators are offered, the standard 21.5 kW unit delivers more than enough power for everyday uses. That same engineering flexibility exists for gyro stabilization. Although we offer both the Seakeeper SK 16 and Seakeeper SK 9, the latter provides a very high level of stability. 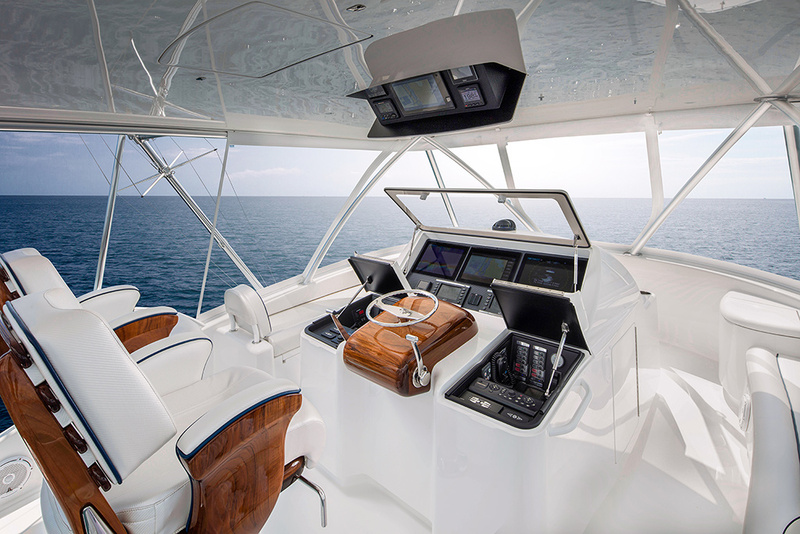 Control of the electrical systems is easily managed, with conveniently located distribution panels in the salon and galley equipped with simple-to-use and clearly labeled conventional switches. Below the water, a series of dedicated pumps for the air conditioning, live wells, washdown and other seawater-fed components have been designed, engineered and installed for durability and longevity. 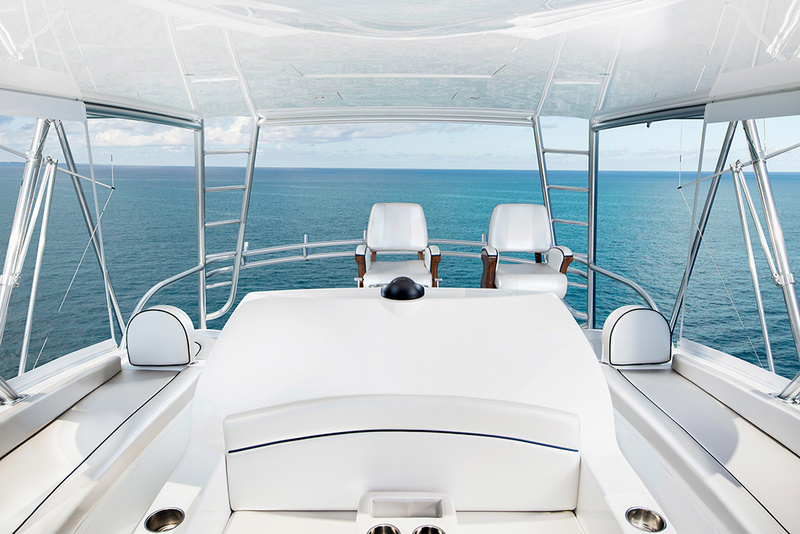 At 165 square feet, the 58 Convertible’s cockpit is the largest in its class—a full 12 square feet bigger than its closest competitor. All of the cockpit’s lids open and close via stainless steel gas pistons. Their undersides are rimmed with thick gasketing, and deep gutters around the hatch openings ensure quick drainage. 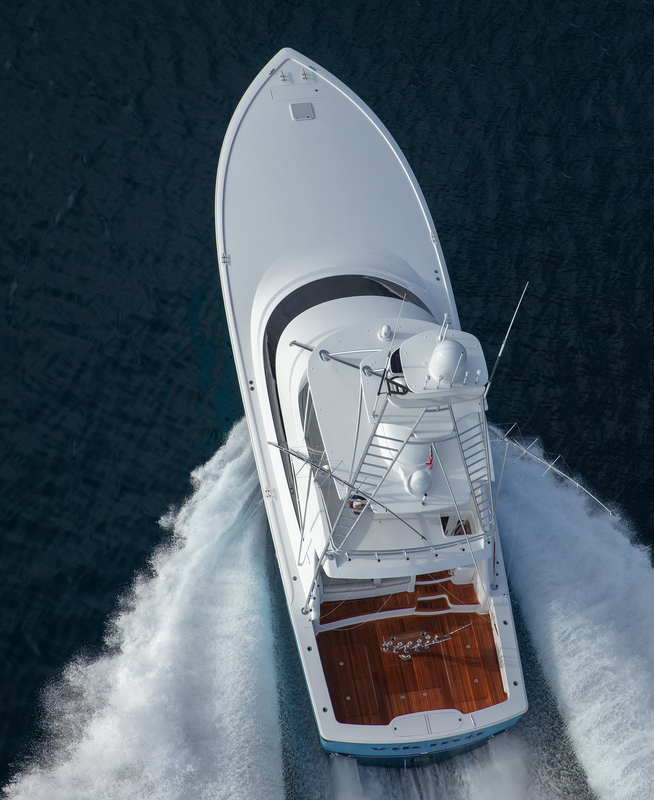 The centerline lazarette houses the Seakeeper and provides access to the steering and drain pumps in the Snow White Awlgripped bilge. 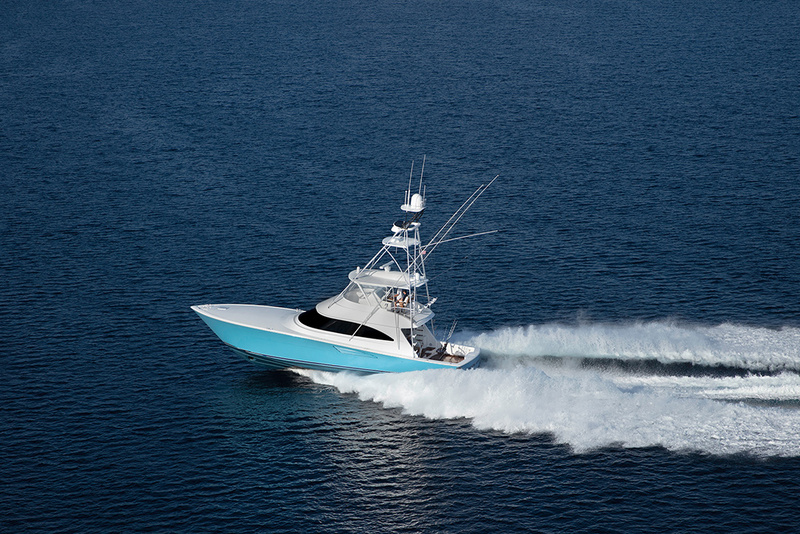 The starboard-side full-length fishbox is insulated and removable, while the port side contains two in-deck storage boxes. The forward unit can be rigged as a live well. The cockpit sole is built with a laminated mounting plate for fighting chair, rocket launcher or table installations. 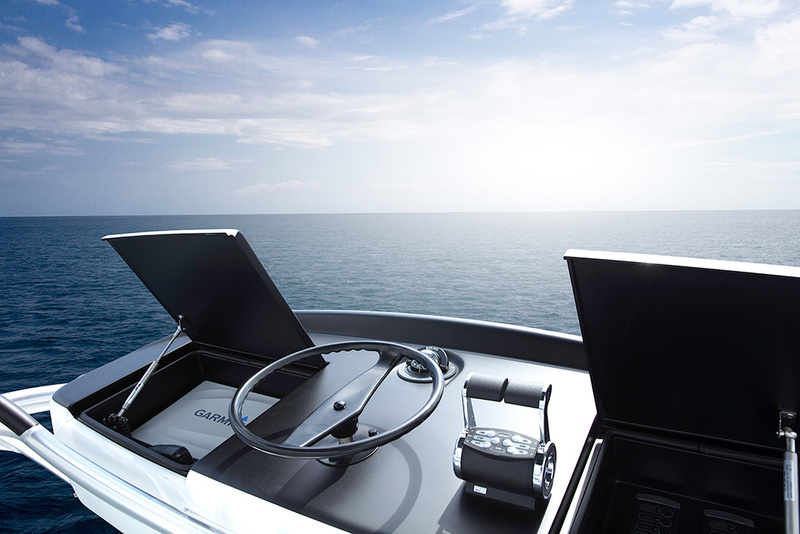 Standard cockpit equipment includes flush-mounted rod holders; a side locker for gaffs; a walk-through transom door with lift gate; rounded coamings and toekick space for comfort and balance; and fresh and seawater wash downs. A comfortable place to take in the action without interfering with the anglers, the observation mezzanine has Sunbrella covered cushions with an armrest that holds a pair of drink holders. The port-side seating has an underneath freezer with cooler space on the step below. The centerline seating provides access to the engineroom; there’s also a refrigerated drink box undermounted in the step leading to the salon. 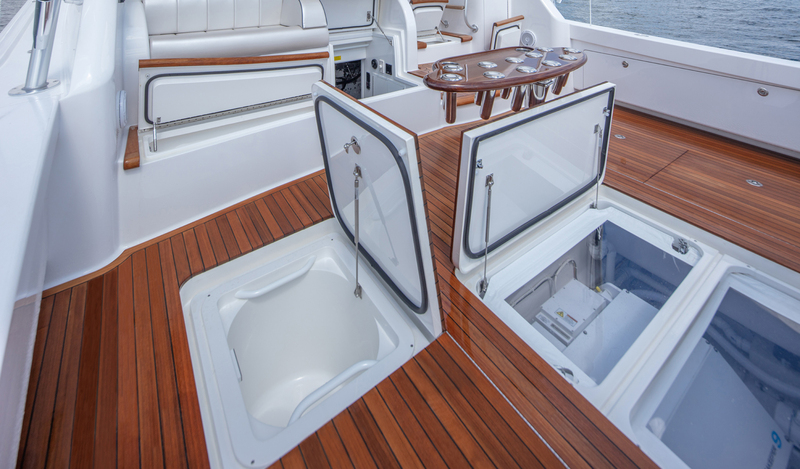 On the starboard side, you have a tackle cabinet with a push-release door and drawers, as well as an insulated storage box in the step below. 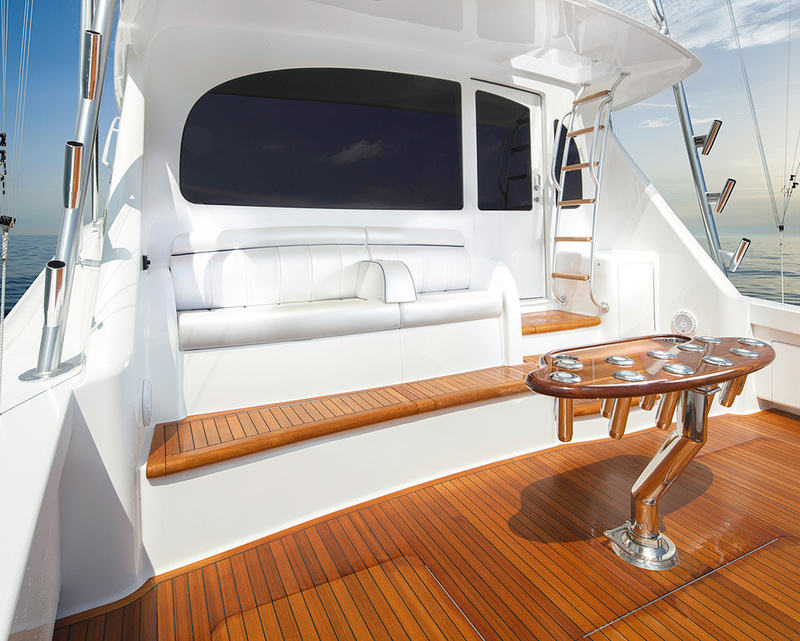 A one-piece anodized aluminum ladder leads to the flybridge. 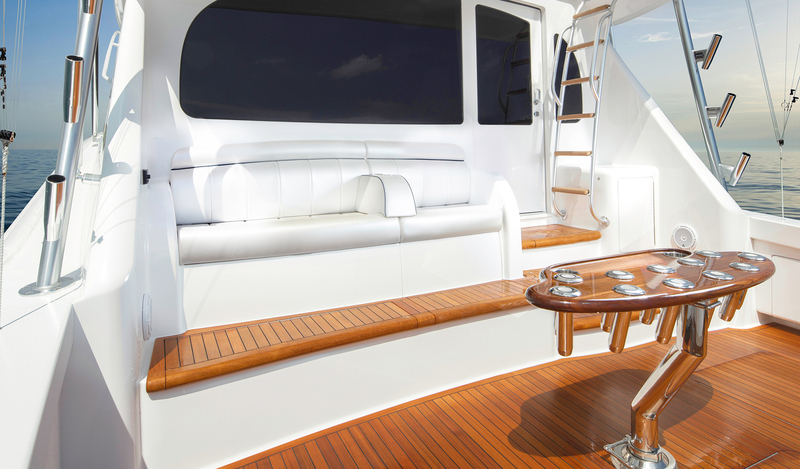 Powder-coated aluminum handrails are conveniently located above the ladder and at the helm. 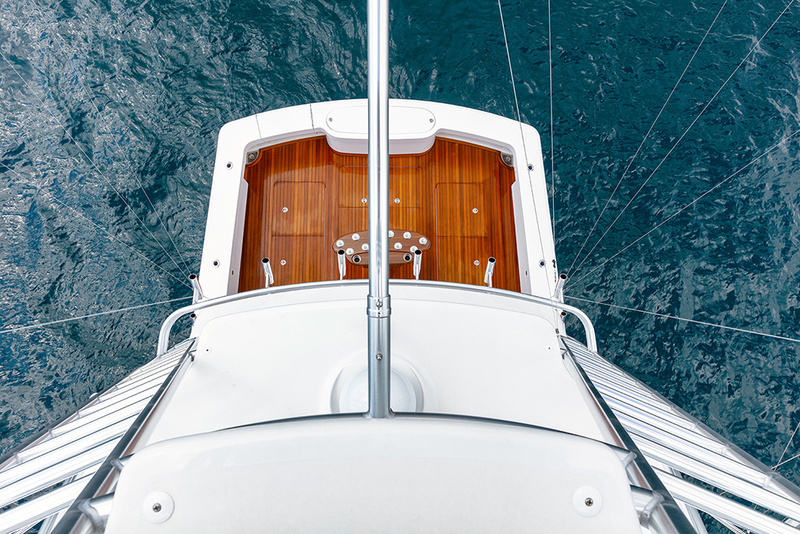 The flybridge’s extended overhang, closed in by an anodized aluminum aft railing, gives you extra room behind the helm and companion seats. 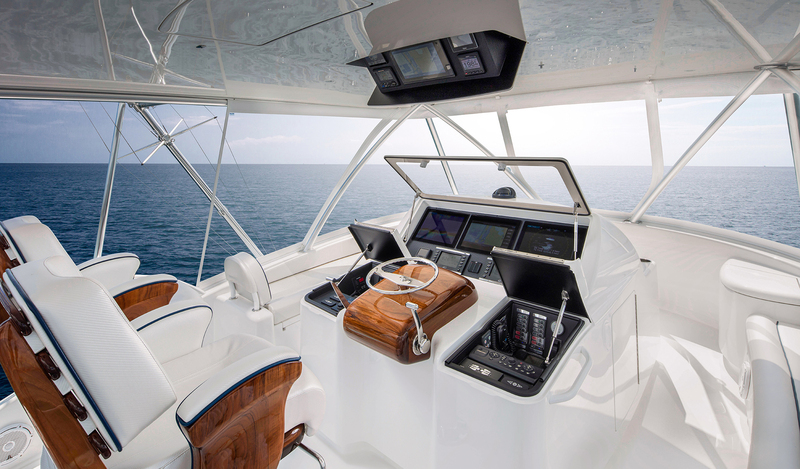 The flybridge features a new design for the center console walk-around helm, with a more radiused shape that gives it a sleek look but also maximizes space. 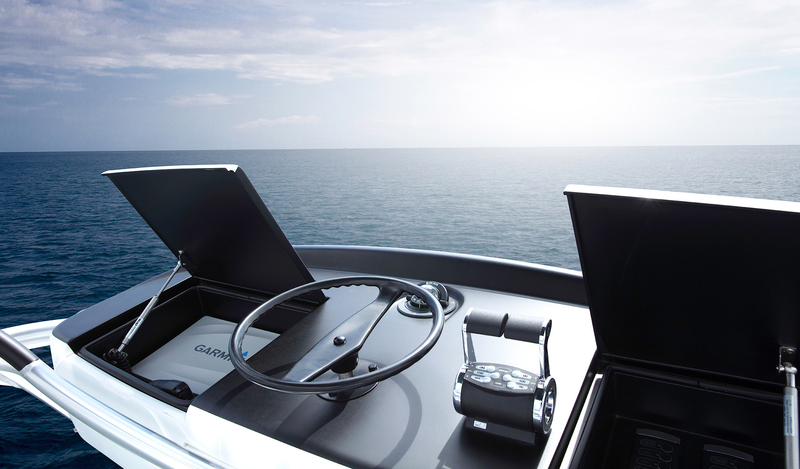 A stainless steel steering wheel and single-lever controls are mounted on a raised teak helm pod. Dual recessed radio boxes with standard hinged split lids flank the wheel. Recessed electronics are installed in the upper console, easily viewable and protected from the elements by acrylic fitted lids with gaskets and stainless steel gas pistons. 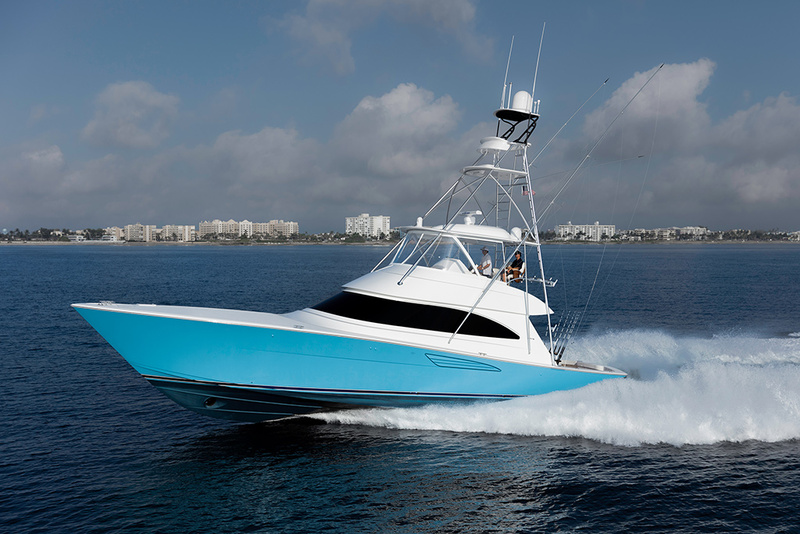 Atlantic Marine Electronics and Palm Beach Towers, both Viking subsidiaries, provide custom electronics and tower installations. An optional powered drop-down hardtop box can hold even more electronics. 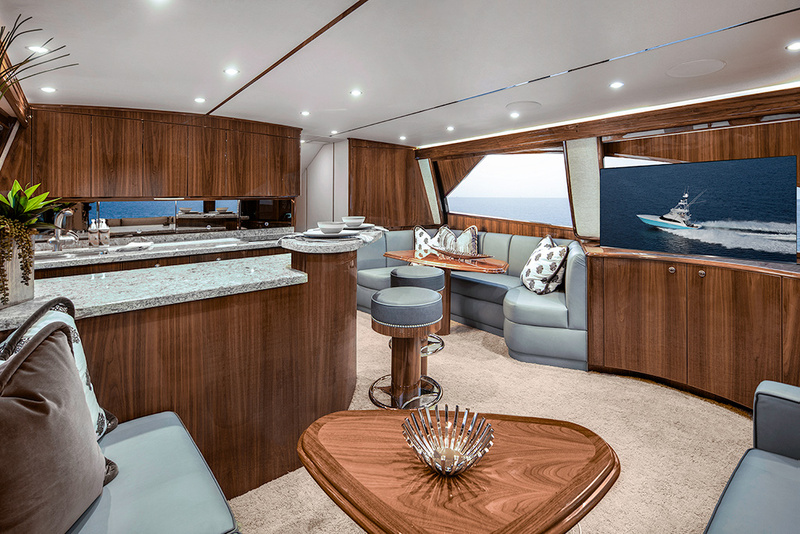 Guests have their choice of port and starboard lounges, a two-person forward console seat and an aft-facing jump seat on the starboard side. 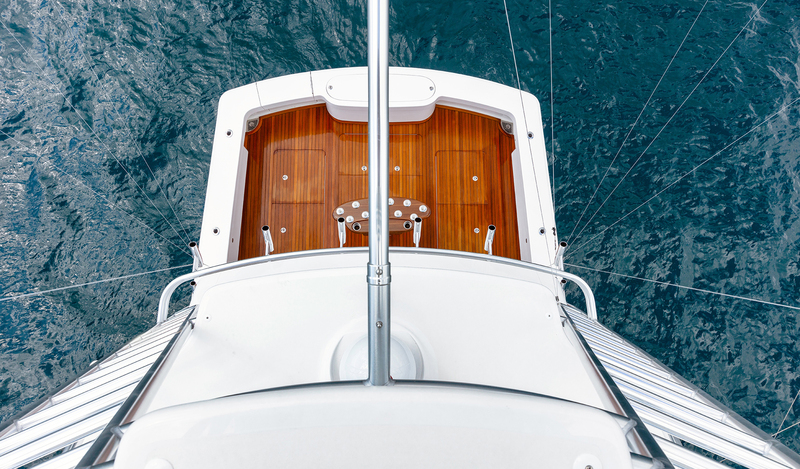 A freezer and a refrigerated drink box are conveniently located in the port and starboard forward corners. 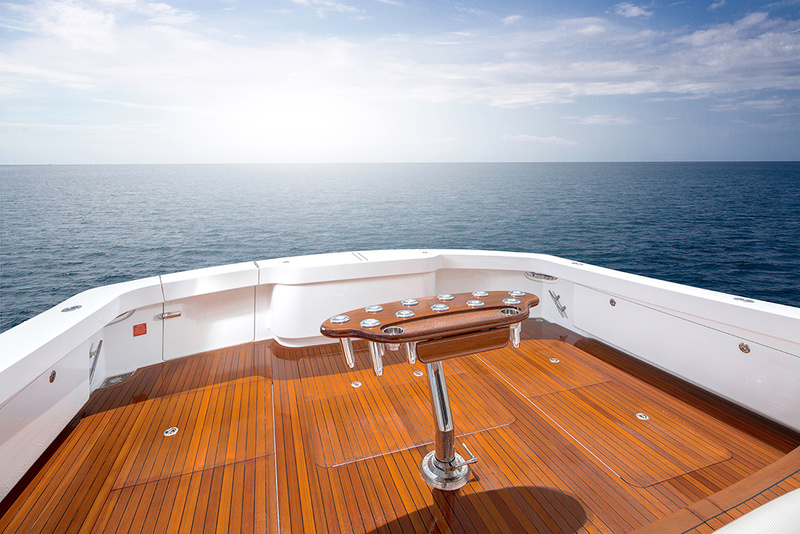 A Costa Clear enclosure provides weather protection and gin-clear views. Step inside the salon and you immediately notice the spaciousness of the layout. Air conditioning registers are concealed behind the valances to reduce noise and drafts, while enhancing air flow. 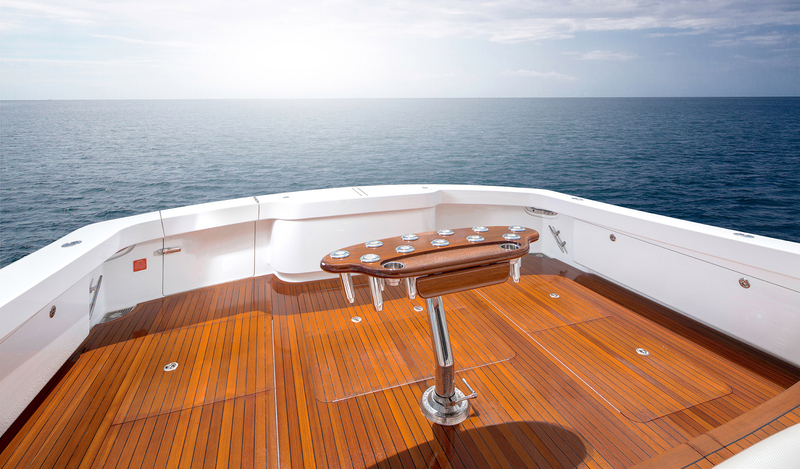 High-gloss teak or walnut are offered for the 58 C’s interior. A satin finish is an option. 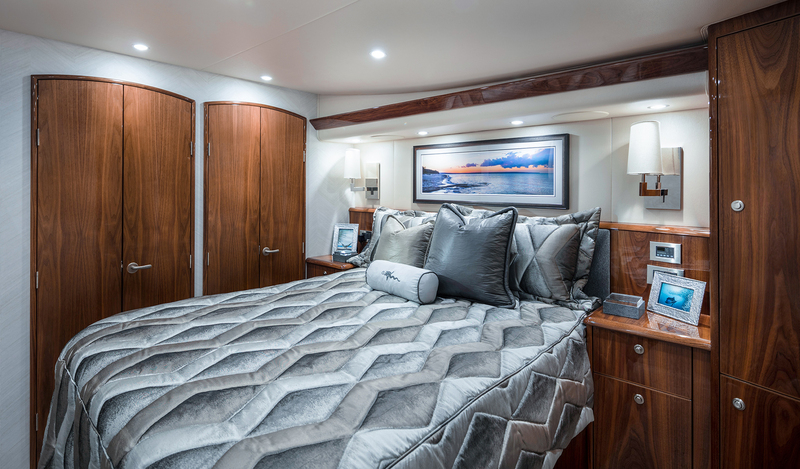 Privacy and comfort are the hallmarks of every Viking yacht interior, and the salon of the 58 Convertible brings these elements to the next level by providing three unique living and entertaining areas. 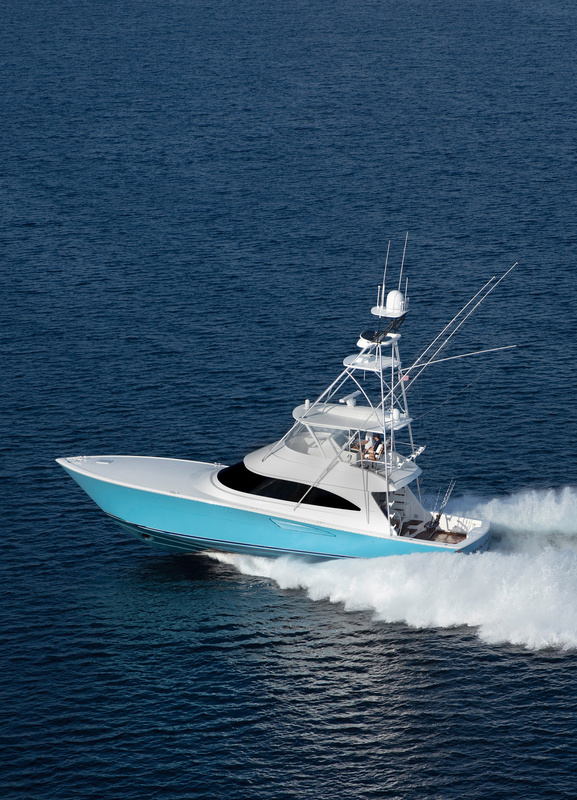 After a day of patrolling the canyons for billfish and tuna, the port-side L-shaped lounge (with underneath storage), which faces the starboard-side HD TV that rises from the starboard-side cabinetry, is a wonderful place to relax and plan tomorrow’s adventures. A hi-lo mappa burl cocktail table is standard and adds versatility to the space. Sub-Zero under-counter refrigeration makes it easy to make sandwiches or grab snacks while keeping an eye on the action in the cockpit through the salon’s aft window. 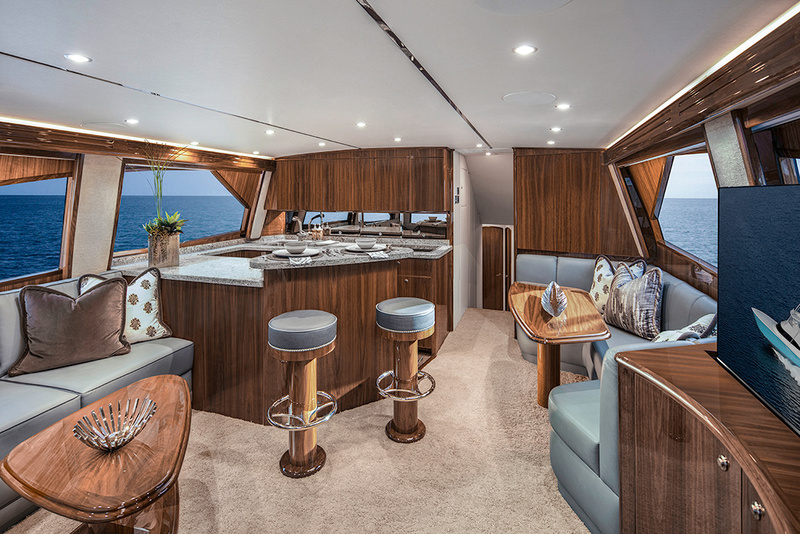 The galley counters and raised bar are topped with engineered stone that artfully complements the teak or walnut cabinetry and the Amtico flooring. The stainless-steel sink, microwave/convection oven and four-burner electric cooktop are nested for convenience and practicality. 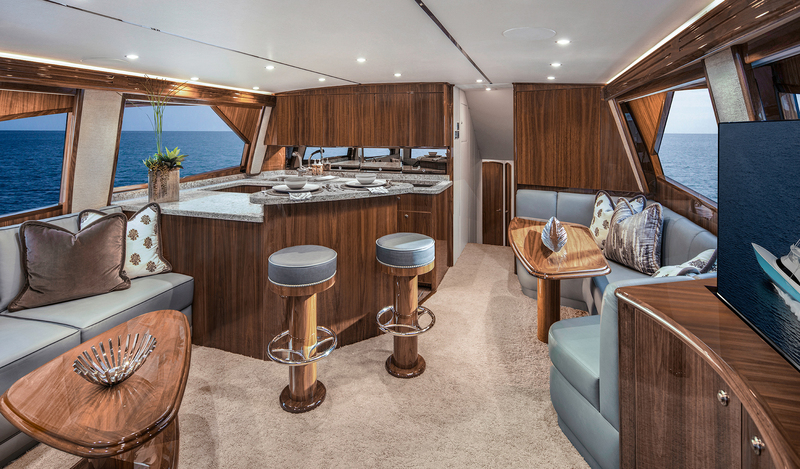 Storage is abundant throughout, and when it’s time to sit down for meals or to relax, the bar stools and starboard-side dinette accommodate a crowd with ease. 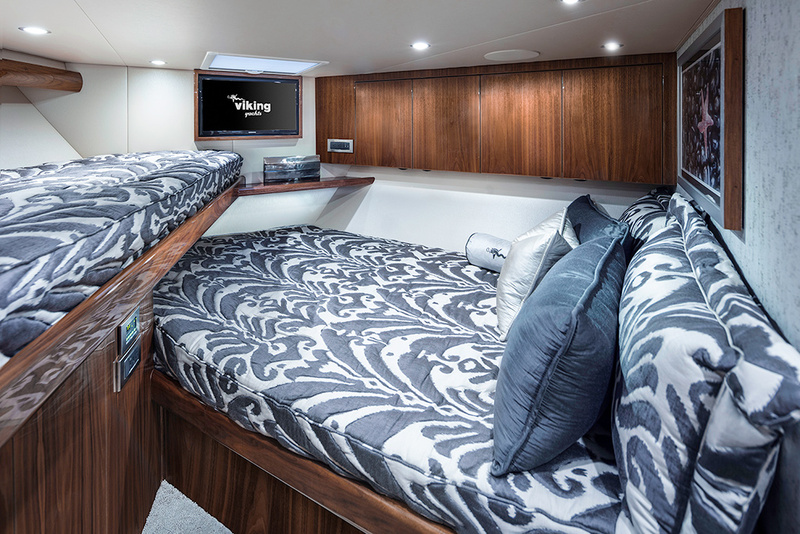 The three-stateroom, two-head layout offers maximum flexibility for cruising as well as campaigning on the tournament trail. Air conditioning with reverse cycle heat and temperature control; wall-to-wall carpeting, overhead LED lights; decorative under-bed rope lighting; Handcraft innerspring mattresses with quilted designer bed spreads; and recessed stereo speakers are some of the comforts and conveniences found in all three staterooms. 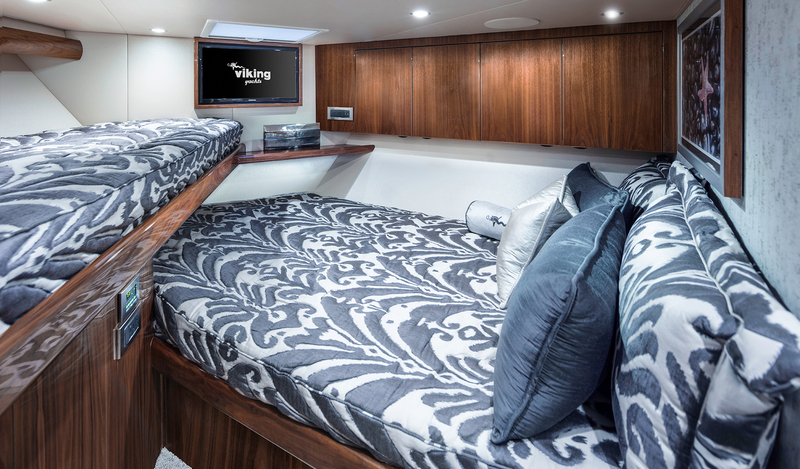 As you would expect from Viking, the master suite is especially spacious and elegant with an athwartship queen walk-around bed and upholstered headboard that faces an HD TV mounted on the inboard bulkhead. Storage includes a credenza, drawers under the bed, end tables, and his and her maple-lined hanging lockers. The forward guest stateroom comes with either a single walkaround queen or crossover berths. 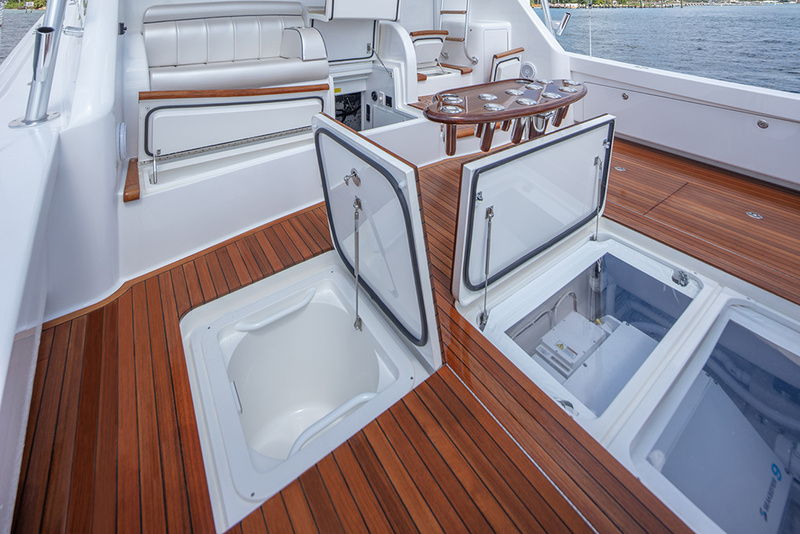 An overhead Bomar foredeck hatch comes with the Ocean Air screen shade system. 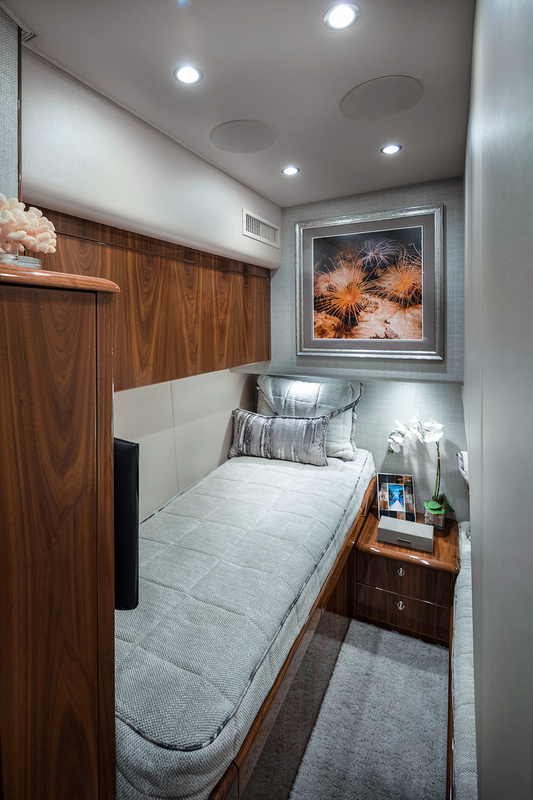 Rounding out the amenities are a spacious maple-lined hanging locker, reading lights, rope lighting behind the valances, and storage drawers and cabinets. In the starboard stateroom, you have side-by-side bunks, a maple-lined hanging locker with drawer storage underneath. An optional HD TV can be installed in both guest suites. The master and guest heads feature Amtico flooring, electric heads, engineered stone countertops and satin nickel hardware. 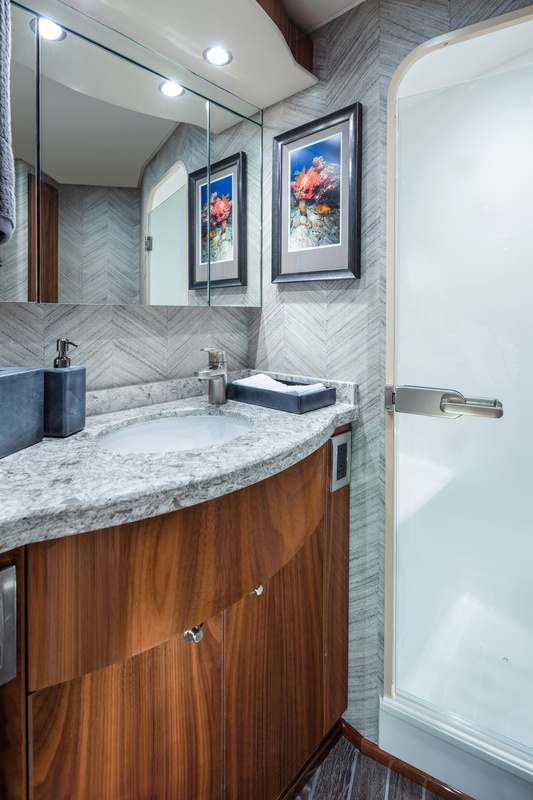 There’s storage in the lower vanity, and the upper vanity includes a mirrored medicine cabinet with doors. 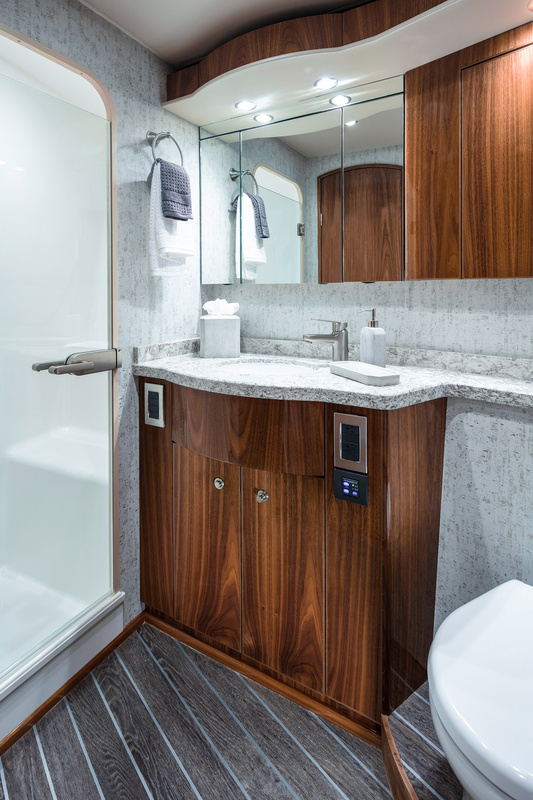 The beautifully finished enclosed showers also have satin nickel fixtures and are equipped with a drain that leads to an automatic sump pump in the bilge. and the forward bulkheads are built in the same resin-infused process but with composite coring material. 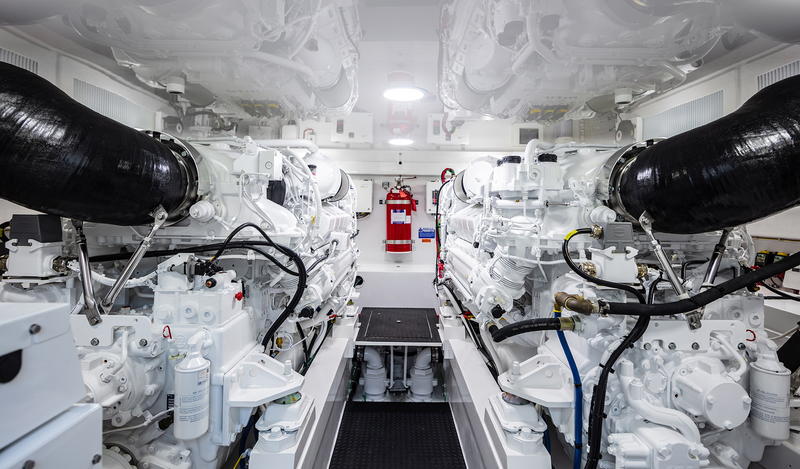 A pair of MAN V12 1400CRM (1400 MHP) engines serve as the standard propulsion package. MAN V12 1550CRM (1550 MHP) and MAN V12 1900CRM (1900 MHP) engines as well as the new MTU 10V2000 M96L (1622 MHP) engines are optional. 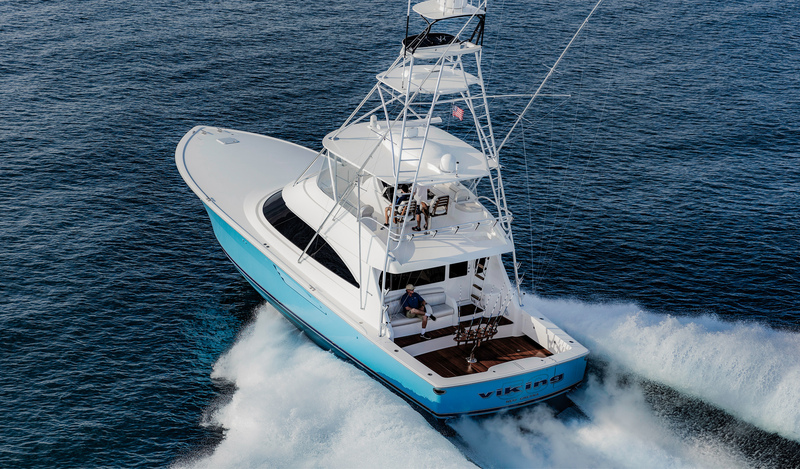 With the MTUs, the Viking 58 Convertible hits 42 knots at the top end and cruises at 36 knots, depending upon load, sea, hull bottom, propeller conditions and ambient temperatures. 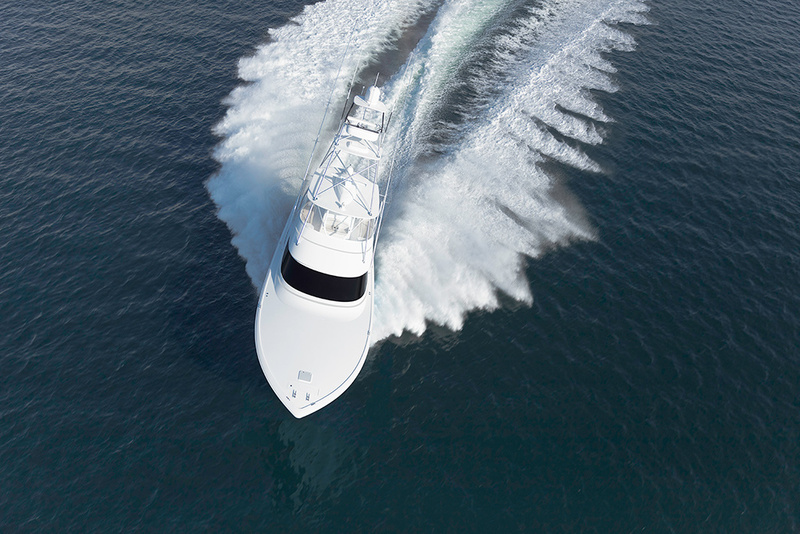 Range exceeds 400 nautical miles at cruise speed. 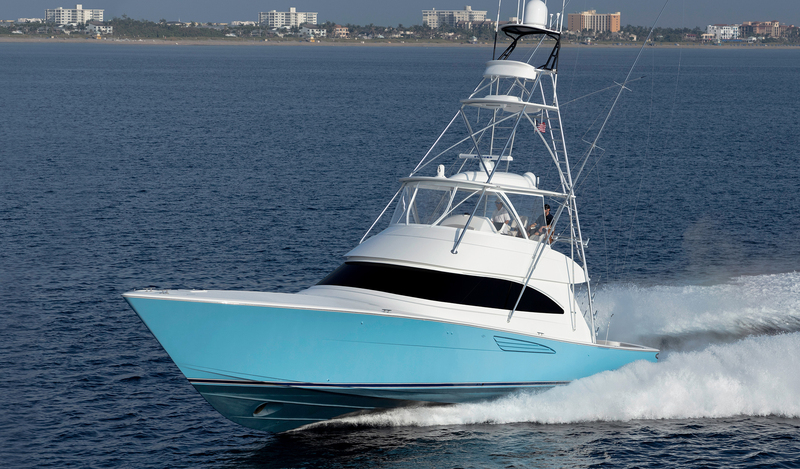 The 58 C maintains Viking’s reputation for engineroom excellence with top-shelf machinery and industry-leading design and engineering. Systems include Delta-T ventilation and water suppression; automatically or manually operated fire suppression tied into the main engine and generator ignitions; integrated engine mounting for efficient transfer of energy to the drive train; and oil changing. 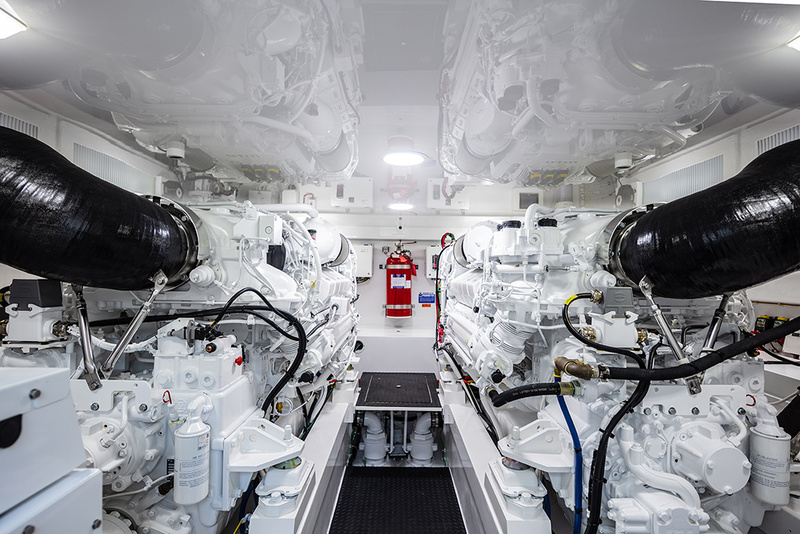 Of course, all of these systems are mounted with superb precision and attention to detail in an immaculate engineroom painted with Snow White Awlgrip for visibility and ease of maintenance.